You'll find everything within reach at Lane Residences. Located in San Antonio Agdao, it lies within the SM City Lanang Premier complex. Its close proximity to Davao International Airport and Seaport gives you that added level of convenience. You get easy access to major land, sea, and air transportation centers to help get you to your next destination. Rounding out the area are the many businesses and offices for enterprising individuals. 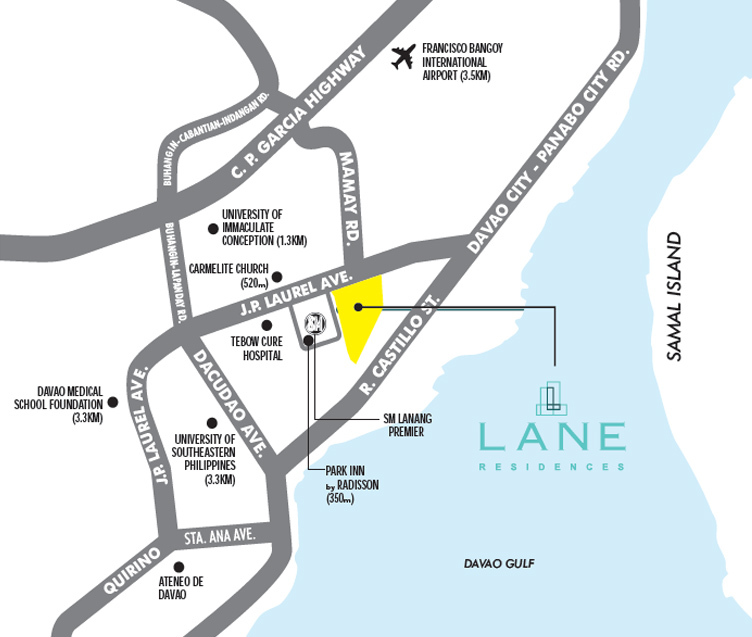 At Lane Residences, you’ll never need to go far to find what you need. With SM Lanang Premier right beside the property, you get a wealth of shopping, entertainment, and dining options waiting to be discovered. All of these come together to bring you a new kind of lifestyle that manages to combine excitement with a relaxing, laid-back vibe, all within the city. A lifestyle where everything adjusts to you.